Venue: St Peters in the City, 130 Spring Street, Tauranga. 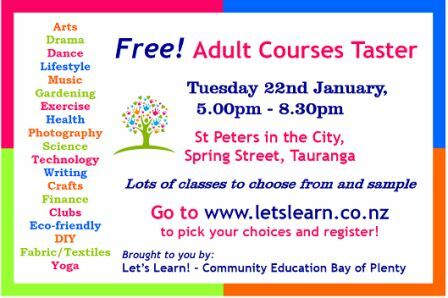 Let's Learn Community Education has organised an Adult Learners’ Course Taster Evening where the public is invited to come along and “taste” some of the learning opportunities that are on offer in Tauranga. The aim is to encourage lifelong learning of all kinds and foster the social interaction and enjoyment that is recognized as important for our wellbeing. This year, a selection of 30 plus different courses and activities covering art, cooking, dance, crafts, music, self improvement, yoga, languages, lifestyle plus many more will be up for sampling. It is totally FREE ! Shelley will be there all evening but with a specific 5.30pm-6.00pm time slot just for French. Stephen will also be there with a 6pm-6.30pm time slot for French Cooking. The full list is on http://letslearn.co.nz/course-taster-evening-registration/. Have a look at the list, spread the word, then come along with your friends. Live up to those New Year resolutions. Have an enjoyable evening browsing the options and find something new to do !